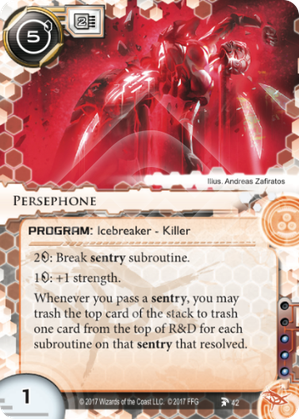 If two subroutines resolve during an encounter with a sentry and the Runner has Persephone installed, how many cards does each player trash from the top of their decks? If the Runner wishes to use Persephone, they must trash 1 card from the top of their stack. This will trash the top 2 cards of R&D. A dream scenario was presented to me last night. Have 3 Persephone installed (including supporting memory hardware). Have 3 Diesel in hand. Click 1, 2 & 3 play Diesels. Click 4 run said Komainu with its 11 subroutines (assuming you started with a full hand of 5). Trash your hand to Komainu. Trash 3 cards from your stack to activate all three Persephones. Corp trashes 33 cards from R&D. Right now, this card is pretty terrible. As a breaker I will quickly run down its stats to remind you why. Its MU intensive, its got a terrible breaker cost and 1 strength. If you want just a breaker, you are better off with almost any other sentry breaker out of Anarch. Cuj0, which is a card that has almost never seem play is a much, much better sentry breaker than this credit hungry monster. So, this is at best a 5 cost, 2 mu back up sentry breaker. Which means there has to be a catch. And there is. Lets look at the other half of this puzzle. "Whenever you pass a sentry, you may trash the top card of the stack to trash one card from the top of R&D for each subroutine on that sentry that resolved." The ability on anything other than a program would probably be great for mill decks. Programs are notoriously vulnerable during runs due to the prevalence of program trashing effects. Meaning this card is both expensive and will very rarely fire. Currently, the best opportunity you have to use this is with Sifr,) D4v1d,) Grappling) Hook or Shaper) programs) and events) that let you change the type of ice, just to open up more of the potential for targets) of the program. With support, it could feed into a mill strategy and may even someday be a support piece in such a plan, but for now I am not convinced. Until DLR rotates, that offers a much, much easier way of doing a similar thing for far, far cheaper.